As many of you know, November is an important month to many writers. 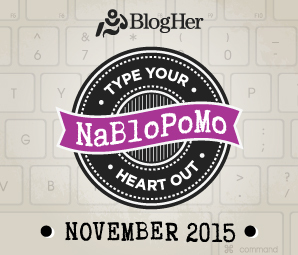 It is National Novel Writing Month, or NaNoWriMo, and many of my peers are participating. The goal is to write 50,000 words – the length of a novel – in a month. In order to keep up with this grueling schedule, many writers participate in word sprints, write-ins, and other communal efforts to encourage each other much like bystanders cheering marathon runners. Alas, much like a marathon, NaNoWriMo requires preparation and training, and I am simply not up to the task. I am not ashamed to admit that I am a glacially slow writer and, as an introvert, social writing is not for me. I am fully aware that no amount of community support is going to magically transform this tortoise into a hare. However, just because 50,000 words in 30 days is galaxies out of my reach – for now – it doesn’t mean that I want to pass up an opportunity to develop the habit of writing daily, a much more realistic and attainable goal. So I decided to do my own version of NaNoWriMo: 30 Days of Blogging. I found this image online and will be sticking to its format. I invite you to come along with me for the ride. You can do your own 30 Days of Blogging, or just stop by on occasion and learn a little bit about me. Either way, it’s not going to cost you anything more than a bit of your time. And maybe some coffee if you’ve got it. I love coffee. I named my blog – and my website – TotallyTawn mainly because I couldn’t think of anything better. My given name is Tawn and this is the place where you will get “nothin’ but Tawn” with all my crazy opinions, weird idiosyncrasies, and inappropriate humor. Where did “Tawn” come from, you ask? Well, my mother has told me that she had too much morphine at my birth, or it was misspelled on my birth certificate, or – the one I choose to believe – I was named after a friend in Germany. The fact that she has never once talked about this friend does not sway me in the least. My name is not short for anything, and I hate being called Tawny, because it reminds me of the blonde from Weekend at Bernie’s, an oblivious one-dimensional character who was only included in the movie as window dressing. I don’t even know why they bothered to give her a name. Attractive window dressing is still decorative. Sorry, Tawny. I have met another Tawn through the wonders of Facebook, and she told me that she was named after a character in a book called The Web of Days by Edna Lee. I promptly tracked down and purchased the book for my library. I have yet to read it, but Tawn is indeed a character. I checked. It may surprise you to learn that I wasn’t always known as Tawn. My middle name is Kimberlee, and this is the name I went by for the first fifteen years of my life. I’m not sure why my parents chose to call me by my middle name rather than my first – my mother insists it’s a German thing – but I can tell how long I’ve known a person by what they call me. And just a side note, it’s Kimber-LEE, not Kimber-LY, in honor of my Uncle Lee. Names are an important part of our identities. I feel like Kimberlee was me as a child, and now Tawn is who I am as an adult. I kept my maiden name when I married because it just didn’t feel like me, as if I would lose something of myself in the transition. Plus, changing your name is expensive and time consuming process involving a lot of paperwork and I am one of the laziest people you will ever meet. I use my married name when I write because I feel that Tawn Krakowski is an author and Tawn Makela is a pilot. Hence, at TotallyTawn, all of these facets of my life come together. In hindsight, I suppose TotalLeeTawn would make more sense, but I only just thought of it now and it would probably be too hard to find with the odd spelling. In any case, that’s all the explanation I have for my blog’s name. Come back tomorrow when I will reveal 20 facts about me for Day 2 of 30 Days of Blogging. Happy Los Dias de los Muertos!